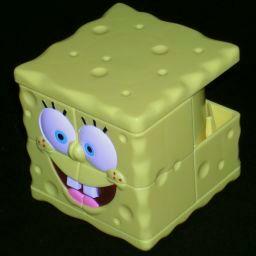 This great little puzzle depicts SpongeBob SquarePants, and was part of a Burger King promotional campaign in 2004. It is a cube divided into two layers of 4 segments. There are 7 pieces, and one blank space. You can either rotate a layer, or slide a piece up or down into the blank space. This puzzle is essentially the same as the Whip-it/Puzzle Tower, but with only 4 columns and 2 layers. Another difference is that the pieces of SpongeBob are all different. Two pieces have eyes, and two form his mouth. The other three pieces have dimples on them, and some of the dimples lie on the piece edges so that there is only one way to correctly position them. There are 7 pieces and a blank space, and these can be arranged in 8! = 40320 ways. This counts every position four times however, since the puzzle remains solved if you rotate both layers in the same direction. The actual number of positions is therefore 8!/4 = 10,080. A computer search produced the table below, and it shows that the puzzle needs at most 25 moves (15.180 on average), or at most 22 (13.276 on average) if you count a half turn of a layer as one move instead of two. Phase 1: Solve SpongeBob's eyes. If the two eyes are already correctly together in the top layer, then skip to phase 2. If the eyes lie in the same layer, then make sure the gap lies in the other layer, turn the layers so that one eye lies above/below the gap, and then move it to the other layer. If the gap is not in the bottom layer, then move up any non-eye piece upwards into the gap. There is one eye in the bottom layer. Find the spot in the top layer where it belongs, and move the piece at that spot down into the gap. Move the eye up into the gap, into its correct place next to the other eye. Phase 2: Solve SpongeBob's mouth. If the two mouth parts are already correctly together in the bottom layer, then skip to step f.
If the mouth parts lie in the same layer, then make sure the gap lies in the other layer, and then move one mouth part into the gap to other layer. If the gap is not in the top layer, then move up the non-face piece in the top layer downwards into the gap. There is mouth part in the top layer. Find the spot in the bottom layer where it belongs, and move the piece at that spot up into the gap. Move the mouth part down into the gap, into its correct place next to the other mouth part. Rotate a layer to bring the mouth and eyes together to form the complete face. Phase 3: Solve the three rear pieces. If the gap is in the bottom layer, move one of the rear pieces down. If the two rear pieces in the bottom layer are correct (they share one dimple), then skip to step d.
Move one rear piece up into the gap, then bring the other rear piece in the top layer down, and realign the layers to make the face whole again. Repeat step c until the bottom layer is correct. 1. Bring one of the mouth parts to the top layer. 2. Bring the gap also to the top layer, without removing the eyes or the mouth part you just put there. 3. Bring the gap to the spot in the bottom layer diagonally opposite the mouth part that is still in that layer. 4. Put the mouth part from the top layer into the gap. 5. Bring the other mouth part to the top layer. 6. Go back to phase 2, step c, and solve it again. This time you should not run into this problem again.